In the winter of 2015 2016 has been generally very mild, however a short period of extreme cold temperatures occurred and attracted many northern migrants to move down to the Black Sea Coastland of Turkey. Common Eider Somateria mollissima has been seeing more frequently and extensively, a record count of 5 birds has been seen at the Sea of Marmara near Hersek Lagünü between 6 and 20 Jan and three in Istanbul on 2 Feb. A single Horned Grebe Podiceps auritus was seen at İğneada, Kırkareli on 8 Jan, and a single Common Scoter Melanitta nigra was at the traditional site at Yeşilırmak Delta together with 52 Velvet Scoter Melanitta fusca on 20 Jan. A single Common Merganser Mergus merganser was also at İğneada on 9 Jan. Most raptors were detected in the well observed Hatay province. A single Black-winged Kite Elanus caeruleus was on Mileyha, Hatay on 6 Feb, and another on 14 May on the known breeding site in Şanlıurfa. A single Red Kite Milvus milvus was seen during passage over Hatay Subaşı, which indicate a wintering presence in the Middle East. A wintering bird as been seeing at Manyas Kuş Gölü on 22 Jan. A single Lesser Kestrel Falco naumanni overwintered at Mileyha, Hatay on 9 Jan.
Seawatching in Mileyha reveiled a Scopoli’s Shearwater Calonectris diomedea on 22 Feb, and 5 Mar. A single Lesser Flamingo Phoeniconaias minor at Lake Kulu between 28 Mar and 5 Apr may relate to the individual observed continuously in the previous years. A single Squacco Heron Ardeola ralloides on 2 Jan at Samsun, Kurupelit Harbour indicate repeated overwintering records. A staggering group of 75 Demoiselle Crane Grus virgo was seen on 23 Mar in Lake Mogan. At the same site there were 5 Little Bustard Tetrax tetrax on 29 Feb. The rarest water record involve a single Caspian Plover Charadrius asiaticus on 4 Apr at Göksu Delta. A single Great Black-backed Gull Larus marinus stayed very long in Istanbul ans been seeing between 1 Jan and 17 Mar several time at Lake Küçükçekmece, İstanbul. Other sighting includes two birds in Sultanahmet area on 2 Feb and 15 May, questioning the possible presence of a total of three birds in Istanbul. A good claim of European Herring Gull Larus argentatus is also photographed at the Black Sea Coast of Istanbul at Rumelifeneri on 16 Feb. Possibly the first Lesser Grey Shrike Lanius minor wintering in the country was recorded at Mileyha, Hatay on 9 Jan. A single Booted Warbler Iduna caligata was there on 12 Apr, a month earlier than the previous record. 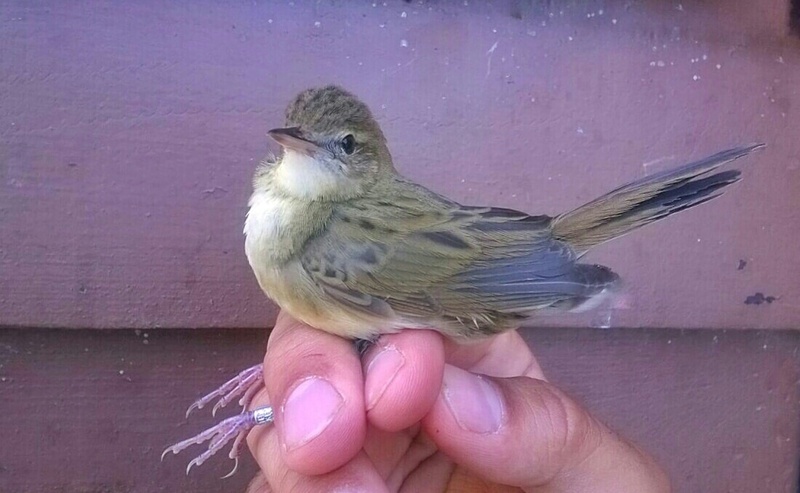 A single Grasshopper Warbler Locustella naevia was ringed on 23 May at Kızılırmak Delta. An Asian Desert Warbler Sylvia nana was seen on 29 Mar in Antalya, after repeated searches for the species following strong storms from the south; this species seems to be regularly at Antalya. Mileyha beach in Hatay produced again a good set of pipits, a single Blyth`s Pipit Anthus godlewskii overwintered between 9 Jan and 26 Mar and three Buff-bellied Pipit Anthus rubescens between 2 Jan and 6 Feb. A visiting birder successfully detected a Trumpeter Finch Bucanetes githagineus at Çıralı Beach, Antalya on 1 May. A single Pine Bunting Emberiza leucocephalos at Yahyalı, Kayseri on 25 Jan was seen.